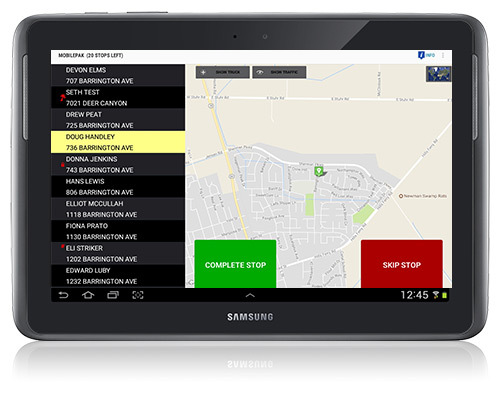 With Mobile-Pak, drivers can easily view and scroll through their route list, update stop activity, and receive dispatched work in real time. Route information is easily entered via a drop down selection that instantly transmits back to Soft-Pak or e-Pak. Driver activities and their GPS locations are sent to customer service or dispatching and displayed via Google Maps. All information flows back to Soft-Pak or e-Pak in real time with back office functions like route productivity, work orders, billing, and route follow up completed instantly. Mobile-Pak can be mounted in the cab for one-touch use or carried by the driver for mobility purposes. Drivers can easily take photos, update notes, and instantly verify additional services with two “click’s”. Truck locations are displayed via GPS (see Map-Pak); thus providing customer service and dispatching with an easy view of the entire fleet. All from a cost effective and rugged hand held device that runs on the Verizon or ATT Network. Easily record an entire day’s activity for playback purposes to ensure drive efficiencies. Improve your fleets performance with the most cost effective mobile application in the marketplace.